On Saturday, 6 October 2018, Kids Are Kids! 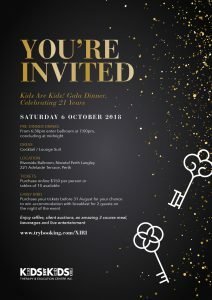 Therapy and Education Centre will be hosting a Gala Dinner at Novotel Perth in celebration of Kids Are Kids! 21st birthday. We are so proud of what our organisation has achieved over this time and the difference our programs have made to the quality of life of so many West Australian children with disabilities and their families, particularly those most vulnerable in our community. Over the years the need for our quality services and expertise has grown immensely. The aim of the 2018 Gala Dinner is to raise the funds needed to expand our premises, so that we can continue to provide affordable therapy for all families. Kids Are Kids! Gala Dinner will be an evening to remember! We offer you delicious food and beverages, exclusive silent auction items (credit card accepted), raffles (cash only please) and fun-filled entertainment. Come along and dance the night away to the fabulous music of LUSH! 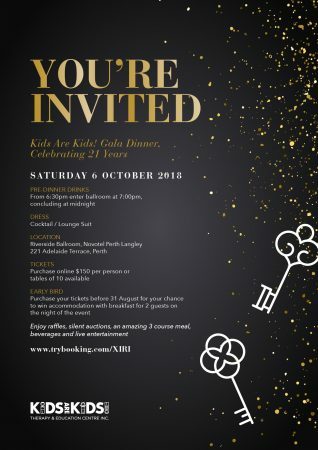 Novotel Perth Langley have generously offered a discounted price to our guests who would like to book accommodation on the night. Should you wish to take advantage please quote the discount code ‘240962 Kids Are Kids’ when you call 9221 1200.